When EA's Star Wars Battlefront was released last year to huge financial success, it was the end of long road in the continuation of the Star Wars Battlefront series. 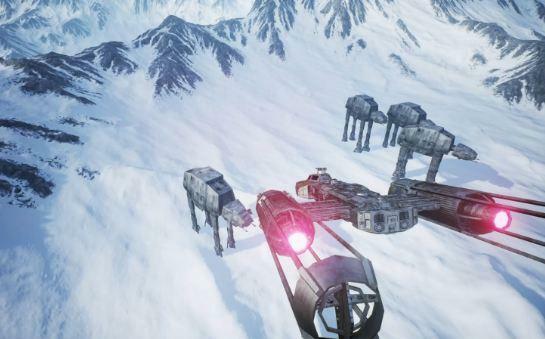 Fans had been crying out for a sequel to 2005's Star Wars Battlefront II and, while it took until 2015 for the series to be continued (and rebooted), there were several attempts to get a sequel made in the interim years. One such attempt was by the studio Free Radical, footage of which leaked back in 2008 (though it has since been removed). Though the game was ultimately cancelled, the studio Front Wire took on the challenge of finishing the game (there were varying reports of how finished the game was prior to it's cancellation). Today, Front Wire announced today that their remake of Free Radical's Star Wars Battlefront III, titled Galaxy in Turmoil, had been approved for free release for fans on Steam (the online gaming platform). No word yet on when the game will actually be released, but it seems that it is imminent. It is with great pleasure that as of today I am able to officially announce that Frontwire Studios has officially signed a distribution deal with Steam/Valve for the game Galaxy in Turmoil. After ongoing discussion between Valve Representatives and myself, Valve/Steam has agreed to ship Galaxy in Turmoil to it’s millions of users for FREE. While this is undoubtedly a big step and accomplishment for Frontwire Studios itself, it’s an even bigger step for you, the community. By Steam agreeing to ship Galaxy in Turmoil we are not only adding more validation and awareness to the project by opening up the game to a whole new audience, we’re also cementing Frontwire Studios’ reputation as an up and coming developer with the opportunity to now publish our games on Steam in the future. This will help us ultimately achieve our goal of making the games that you, the community want. On a final note; People have been expressed their concern as of late, saying they expect us to get a Cease & Desist from Disney. I’ll be honest – I’ve had mild concerns myself from time to time. However Valve clearly lacks that same concern. By agreeing to publish Galaxy in Turmoil, Valve is assisting us in growing and ensuring the longevity of the Galaxy in Turmoil project and community as a whole. All of this sounds very exciting for Star Wars fans and gamers, though I remain skeptical about whether Lucasfilm/Disney will allow the game to be released (though hopefully the fact that its free will help its chances). Regardless, I can't help but admire the work and dedication put into this by the Front Wire Studios team. Since it uses property of Star Wars, Lucasfilm/Disney will shut this down. Yes its free and dont have a Star Wars-name, but they are still doing a game that can harm the releases of EA-games. They should have tried 5 years ago.